The president revealed his choice in a prime-time announcement. President Donald Trump has announced U.S. Circuit Court Judge Brett Kavanaugh as his second U.S. Supreme Court justice pick less than two years into his presidency. In a prime-time announcement in the East Room of the White House, President Trump set the stage for a high-stakes battle over a nominee who lawmakers from both ends of the political spectrum have argued could alter the course of the nation’s highest court for a generation. (Saul Loeb/AFP/Getty Images) Judge Brett Kavanaugh speaks after being nominated by US President Donald Trump to the Supreme Court in the East Room of the White House on July 9, 2018 in Washington. 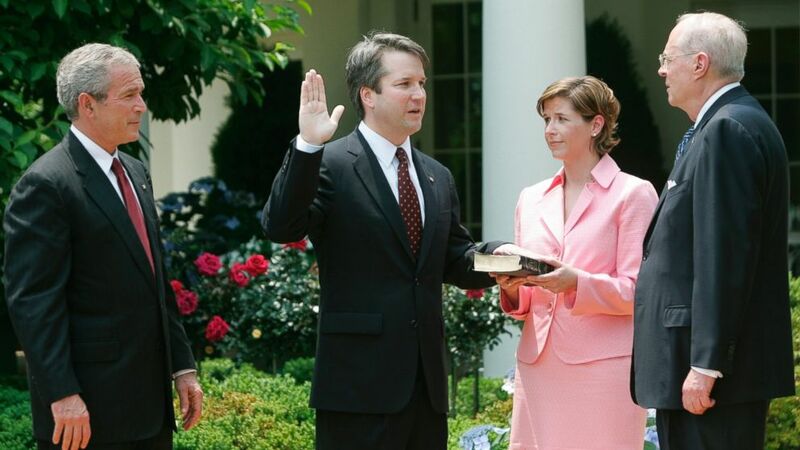 Kavanaugh, 53, is a Yale Law School graduate who has served on the D.C. Circuit Court for 12 years and was once a former clerk to the retiring Justice Anthony Kennedy. While Kavanaugh was framed as the more “establishment” conservative pick of the other candidates, various Republicans had phoned President Trump last week to voice their objections over his potential nomination, including about a 2011 opinion where he declined to rule the Obamacare health insurance mandate as unconstitutional. Trump heaped praise on him as the judge's wife, Ashley Estes Kavanaugh, and their young daughters, Margaret and Liza, looked on. (Jim Lo Scalzo/EPA/REX via Shutterstock) Judge Brett Kavanaugh speaks after President Donald J. Trump announced him his nominee to replace retiring Supreme Court Justice Anthony Kennedy, in Washington, July 9, 2018. Democrats, meanwhile, have raised alarm not just over Kavanaugh’s conservative bona fides, but one of his past academic writings in which he argued presidents “should be excused from some of the burdens of ordinary citizenship while serving in office” such as responding to civil lawsuits and investigative inquiries based out of criminal charges. Such a stance could prove relevant if the Supreme Court is ever tasked with deciding the fate of actions in Robert Mueller’s Russia investigation, such as an attempt at subpoenaing the president for an interview. Kavanaugh wrote those comments a decade after serving in the 1990s on Kenneth Starr's independent counsel team investigating President Bill Clinton and helped write the Starr Report to Congress that provided grounds for Clinton's impeachment. In 2003, after serving in the White House under President George W. Bush, Bush nominated him to the federal bench. After an extended confirmation battle, he was confirmed in 2006. Despite reported tensions between Trump and the Bush family, the former president issued a statement Monday night lauding both Trump and Kavanaugh. 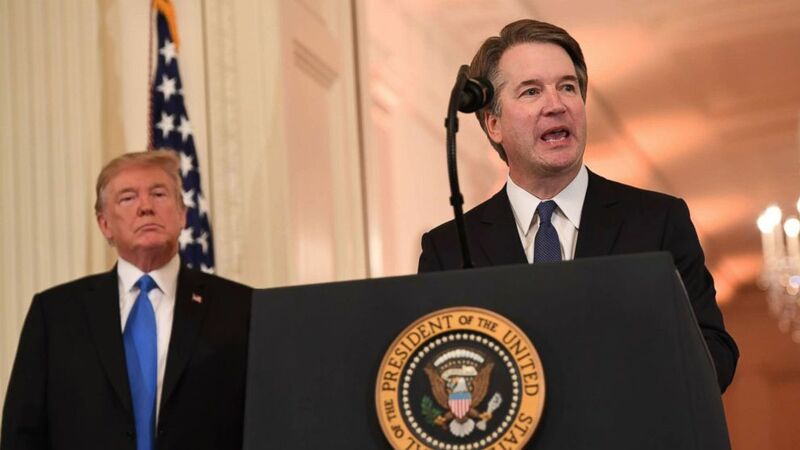 "President Trump has made an outstanding decision in nominating Judge Brett Kavanaugh to the Supreme Court. Brett is a brilliant jurist who has faithfully applied the Constitution and laws throughout his 12 years on the D.C. Circuit," Bush said. "He is a fine husband, father, and friend – and a man of the highest integrity. He will make a superb Justice of the Supreme Court of the United States." Legislative Affairs Director Marc Short told reporters following the president's announcement that the White House hopes to have a confirmation vote on Kavanaugh before October 1, the start of the court's term. With mere hours left to go before his self-imposed deadline, Trump, who had been consulting with family, friends and advisers this past weekend while in Bedminster, New Jersey, had not made a final decision. Multiple sources told ABC News that as of Sunday, the final four individuals Trump was considering for the vacancy were Kavanaugh, Amy Coney Barrett, Raymond Kethledge and Thomas Hardiman, all federal appeals court judges. Trump’s aides have prepared briefing books and booked television spots for his pick, anticipating that they’d have little time to spare between his decision and the reveal, sources tell ABC News. In the run-up to his announcement, the president had targeted four top contenders from a list of 25 administration-approved judges, former judges and one member of Congress, as curated by Leonard Leo, executive vice president of the Federalist Society and Trump’s top Supreme Court adviser. In anticipation of Trump filling the vacancy left by the retiring Anthony Kennedy – widely considered to be the court’s “swing vote” – with a judge thought to have more conservative bona fides, many outside advocacy groups are already bracing for what will likely be a contentious confirmation battle. (AP) In this June 1, 2006 file photo, from left to right, President Bush, watches the swearing-in of Brett Kavanaugh as Judge for the U.S. Court of Appeals for the District of Columbia by U.S.
Conservative groups like the Judicial Crisis Network and American Crossroads have each pledged over $1 million in ads encouraging support or opposition to Trump’s eventual nominee. Meanwhile, liberal groups like NARAL Pro-Choice, Protect our Care and Demand Justice are pouring millions into ad campaigns of their own, drawing attention to what a conservative-leaning justice might mean for abortion rights, in particular. Liberal groups have geared up to protect Roe v. Wade, the Supreme Court case that upheld abortion rights, from being overturned. The issue has even prompted moderate Republican Sen. Susan Collins, of Maine, to speak out, telling Stephanopoulos last week that a candidate who would overturn Roe v. Wade “would not be acceptable,” because it indicates an “activist agenda” she didn’t want to see in a judge. Kavanaugh avoided any direct reference to specific issues in front of the court in his remarks in the East Room, but said that he will be visiting Capitol Hill Tuesday to assure senators that he will commit to "keep an open mind in every case." Kavanaugh also emphasized in his remarks his belief that judges "must be independent" and "interpret the law, not make the law," a position that could be directed at those who fear Kavanaugh's appointment would lead to Roe v. Wade being overturned. 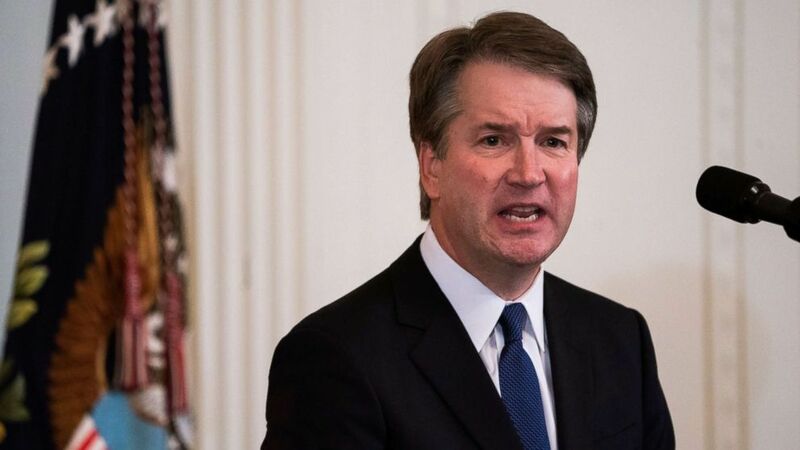 "A judge must interpret statutes as written, and a judge must interpret the constitution as written," Kavanaugh said. "Informed by history and tradition and precedent." Conservatives, meanwhile, have both downplayed and hailed the possibility of reversing Roe. “I think it’s a bit of a scare tactic and rank speculation,” Leo said on “This Week” Sunday, saying “nobody really knows” how Trump’s nominee would rule on abortion if it ever arose. Democrats may have a tough time putting up a procedural fight in the Senate, though, after Republicans in 2017 triggered the so-called “nuclear option” that allowed them to end Democratic filibustering of then-nominee Gorsuch by a simple majority vote, as opposed to the 60 votes previously required. The Republican party and other top political allies of the president have signaled they will set their sights on pressuring a select number of red-state Senate Democrats up for re-election in states President Trump won in 2016, including three who actually voted for the president’s previous nominee Neil Gorsuch in 2017. The White House extended invitations to Democratic Sens. Heidi Heitkamp of North Dakota, Joe Donnelly of Indiana, Joe Manchin of West Virginia, and Doug Jones of Alabama to attend the evening White House announcement, but all declined to attend. ABC News’ Jonathan Karl, John Santucci, Tara Palmeri, Meridith McGraw, Ali Rogin, and John Verhovek contributed to this report.